This is a wooden combination display case and cash register stand. Get the best of both worlds with this combo setup. 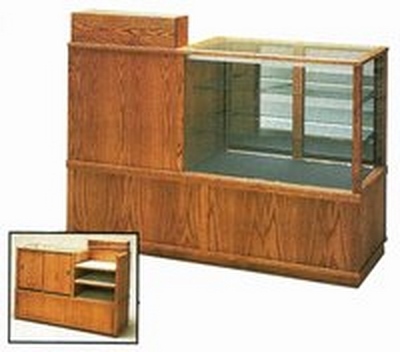 The display case section of this product features 2 adjustable tempered glass shelves. The adjustability allows for larger items to be placed on display as well. The cash register stand is conveniently located adjacent from the display. You can use this to display items you want customers to see right before checkout. There are sliding mirror doors on the display case with a lock to keep items safe and secure. The black velvet on the display area greatly increases visibility by upping the contrast. Full vision display cases allow you products to have the upmost visibility. The attached cash register stand makes it also convenient for customers. We also build custom wooden combination display cases if this design does not fit your requirements exactly. Click here to view the full line of custom finishes we have available for this combination display case and cash wrap.